Just Listed :: Gorgeous Brick Traditional in East Cobb! Welcome home! 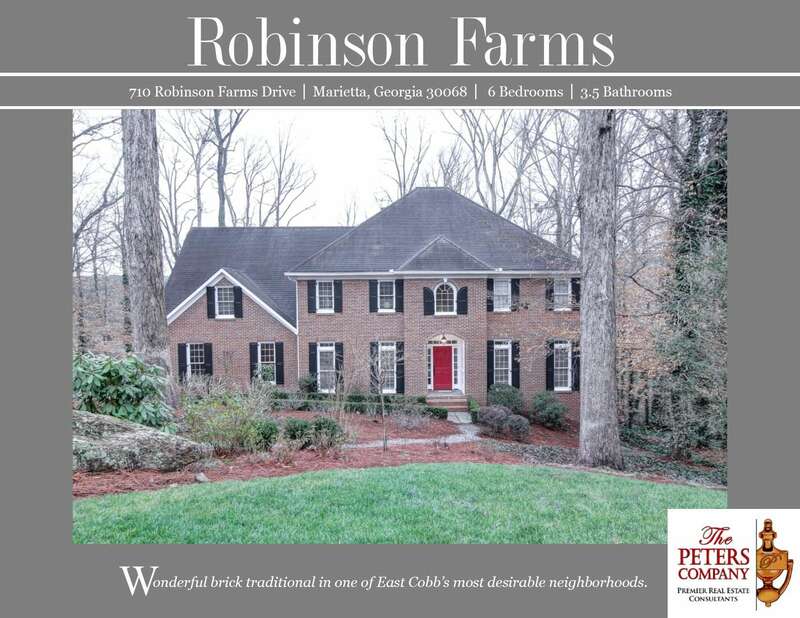 Nestled on a quiet cul-de-sac in the popular Robinson Farms swim and tennis neighborhood, this home is just what you’ve been looking for. The flowing floor plan, custom features, and charming character will never go out of style. Being close to I-75, Roswell Road, and Johnson Ferry Road makes virtually all commutes a breeze. You’ll also have easy access to the other highways, byways, and activities that make this location such a well loved destination! Being in this popular area of East Cobb means you can enjoy many nearby restaurants and shopping spots too! This home is located in a highly sought after school district which includes Eastside Elementary, Dodgen Middle, and Walton High! · Light and airy two story foyer welcomes you into the home. · Spacious kitchen features cabinets with pull-out drawers, granite counters, pantry, double ovens, office nook, and spacious breakfast area with fireplace. · Large family room boasts a soaring ceiling, built-in bookcase, and cozy fireplace. · Tall ceilings, gleaming hardwood floors, and crown molding are carried throughout the main level. · The master on main is a true retreat including a large walk-in closet with custom shelving and spa-like master bathroom with double vanity, jetted tub, and separate shower. · Secondary bedrooms are well-sized and bright with excellent closet space. Potential for second master suite upstairs. · Full unfinished basement provides tons of storage space and is just waiting for your ideas. · Two car garage and additional parking pad can easily fit vehicles. · Screened-in porch and two decks are perfect for outdoor enjoyment and entertaining. They overlook the grassy, usable backyard. · Professional landscaping showcased in the front and back yards. · New carpet and paint throughout the entire home.